it’s likely someone put it there. This ancient Basque proverb is the only advice Heather can give her children as they set out on a quest to find their father. Now Heather is no longer a working animal, she is having to cope with the inevitable problems which come with raising two cheeky, opinionated, adolescent piglets. When a near disaster leaves Heather at death’s door, her friend Rhona takes matters into her own hands. She decides the piglets need some discipline, and if Heather is too ill to provide it, she must find someone who can. She sends the piglets off to find Aitor, their father, last seen in a disused coalmine outside Gateshead some two years ago. 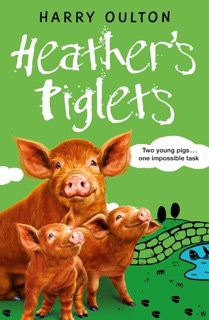 Armed only with their own YP (young piglet) savvy, and accompanied by one of Alastair and Izzy’s puppies, the piglets Tor (he refuses to be called Aitor) and Eder must travel south into England and try and find out if their father is alive, and if he is, where exactly is he now? The journey will take them to Fortingall, over Hadrian’s wall and then deep into the myth of Sewingshields and the Arthurian legends which run like seams of coal throughout the north of England. When a message comes saying that Heather is getting worse, Tor and Eder are left with no choice but to seek help from the legendary and terrifying ‘Seneschal’. Heather’s piglets – what you’re looking for can often be closer than you think.